Me trying to be grown up. 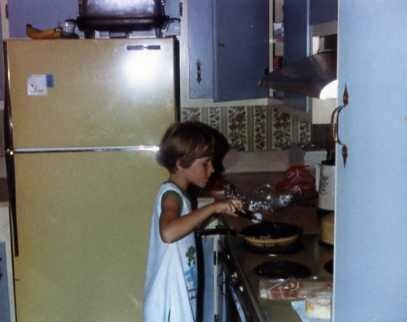 My inner child is still scarred by that kitchen. The past year has been a very big year for me emotionally. I have learned so much about the things that were holding me back and what I need to do to move on. I wrote this post about trying new things and facing the world as an adult. Everything changes when you stop being a timid child and start taking the place God set you up in as a grown up. Even the little things like how I have stopped buying white underwear. I was buying them out of habit and I don’t like them. I like the solid colored ones so I buy those. And if they have a bow on them, it comes off with the tags. I am not ten any more so bye-bye bows. That is a silly way that I have started to stand in my place as mother and wife and woman. I have also fussed at my husband for telling me I shouldn’t have french fries so close to dinner. That poor man didn’t know I was coming to grips with my new-found security as a grown woman. He just sat dumbfounded in the McDonald’s drive-thru. In big ways and small ways, growing up has been good. But recently I realized it was getting out of hand. my children were waiting. I saw a huge, I mean huge, sycamore leaf start blowing across my path. My reflex was to go after it, grab it up and show it to my kids. The next quick thought was about how silly I would look, as a grown up, chasing that leaf. Thankfully, I had one more thought; I am not that grown up, I’m getting that leaf! 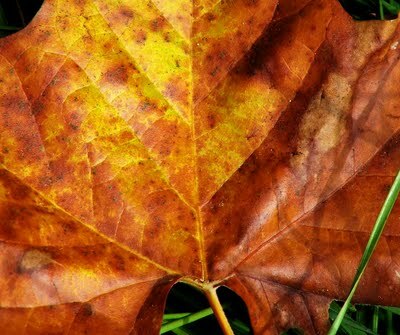 It was not the largest leaf I’ve ever seen, nor the prettiest but I just didn’t want to be that person who thinks they are too old or too dignified or too whatever to do the fun thing – the childish thing. I have always been that person who tells everyone to look at the moon or that tree or those clouds. I have always been a joiner when a game is coming out of the box. When we bought Just Dance 2, I had to make a decision for fun over dignity. There is no dignity in a short, white, amateur woman dancing. So I just laugh as I flail around to a song that is actually saying, “got me lookin’ so crazy right now.” It is funny and true. The kid in me has been winning out for all these years in good ways and bad ways, but I caught myself trying to throw that poor baby out with the bath water. There are things about my inner child that need to stay. In the Bible, Paul talks about how when he was a child he did childish things but as a man he put away those childish things. He is describing spiritual growth and what must happen for growth to occur. But Jesus tells us that unless we become as children, we will not see the Kingdom. So growing up must be about doing both in some way. We must sort out the childish things that hinder out growth and hold on to the wonder, acceptance and childlike faith of our younger years. As a mom, it is important for my children to see me still amazed at the world around me, still willing to put fun ahead of formality, and still believing in things that are just too big for me to understand. They may even be less amused by a giant leaf than I am. They could be tired of me showing them the same moon they saw last month, but I believe it is good for them to see that side of me. They have no trouble seeing me as their parent, but can they see that I am God’s child, just like they are, no matter what age I get to be? It makes me think of an elegant, elderly lady I sat next to in a waiting room one day. We were both reading quietly for several minutes. A little while later, I heard her laugh out loud a little. Then, after a minute, she laughed even longer and louder. Something in her book was funny and she gave in to it. She laughed in the face of decorum and societal norms and I smiled. I wanna be that lady when I grow up. This entry was posted in Christian living, deep mom thoughts, parenting styles and tagged acting your age, being childish, growing up, inner child, your inner child by lookmom. Bookmark the permalink.